FIGURE 8.1. Broadcast fertilizer spreader. applicators. The application of liquid fertilizers follows the same principles as spraying chemicals and sprayers are discussed in a separate section. Gaseous fertilizers require specialized equipment and are very hazardous to use. The equipment to dispense gaseous fertilizers is not included in this text. Most granular fertilizer applicators will be one of two designs, broadcast or gravity flow. 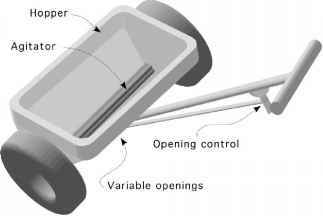 As with any agricultural machinery, designs vary, but a common tractor powered spreader consist of a hopper that holds the material, a metering mechanism, and a spreading mechanism, Figure 8.1. The hopper capacity will vary depending on the size of the machine. Metering usually is accomplished through the use of a variable-speed chain belt in the bottom of the hopper and an adjustable opening. 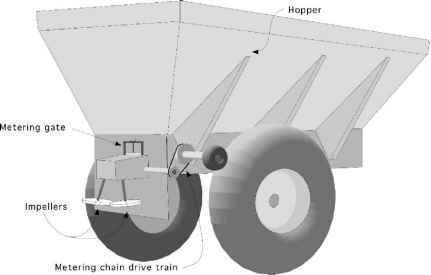 The chain belt generally is operated by a drive train powered by one of the wheels of the spreader. Because a ground wheel drives the chain belt, the amount of material dispensed changes as the speed of the spreader changes. The impellers are usually powered by the tractor PTO and must turn at a constant speed for the spreader to have a consistent dispersal pattern. In this design the application rate of the material is set by changing the speed ratio of the drive train that powers the metering device and/or changing the size of the opening at the metering gate. The process of using a variable opening for metering is called bulk metering. Bulk metering units meter the volume of material applied. The material usually is spread as it drops onto one or more rotating disks, impellers, which sling it out in a wide pattern either behind or in front of the spreader. An alternative design powers the impellers from one of the ground wheels, eliminating the need for a PTO or additional power source. FIGURE 8.2. Gravity fertilizer spreader. Gravity flow applicators also use a hopper, Figure 8.2, but in this type of applicator the hopper extends across the width of the machine. The material is dispensed through adjustable openings along the bottom of the hopper. The rate of material flow is set by the size of the opening. This design uses an agitator along the bottom to prevent the material from bridging across the hopper and to break up lumps, thus improving the uniformity of flow. The material flows through the openings and onto the soil surface. At one time gravity flow fertilizer spreaders were popular in agriculture, but limits on practical widths has almost eliminated agricultural uses. Small ones are still used for lawn care and other situations where 18 to 24 inch widths can be effective. 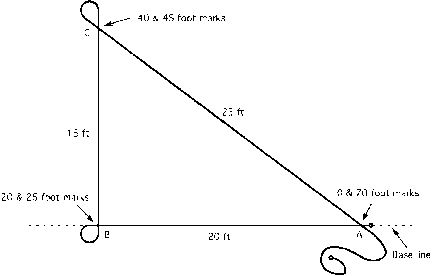 n where R = application rate (lb/ac); W = weight of material (lb); nr = number of revolutions of drive wheel; A = area (acres). where R = application rate (lb/ac); W = weight of material collected (lb); A = area (ac). Problem: You set your neighbor's spreader to apply 1,200 lb/ac of fertilizer. During a stationary calibration of the applicator 160.0 lb of fertilizer were collected as the drive wheel was turned 15 revolutions. The effective radius of the drive wheel is 21.0 inches and the effective width of the spreader is 30.0 ft. Is the application rate correct? In this problem the spreader is applying 200 lb/ac more than the desired amount. Is this an acceptable level of accuracy? Should the spreader metering unit be adjusted and rechecked? No consistent standard has been established to determine the acceptable error for broadcast fertilizer spreaders. One way to evaluate the error is to calculate the percentage (%) of error. In this example the amount of error was 17% [(200 lb/1200 lb) x 100]. It would be up to the owner/operator to determine if 17% was an acceptable level of error. The one major disadvantage of the stationary method of calibrating broadcast applicators is the problem of collecting the fertilizer during the calibration process (160 lb in this example). The quantity of material that must be collected will be greater if the desired application rate (lb/ac) is increased, or if the number of revolutions is increased. The primary advantage of this method is that it can be performed when it is impossible to have the applicator in the field, for instance, because of muddy ground or inclement weather. The alternative is to complete a mobile calibration. This can be accomplished in two ways. In the first method, collectors (flat pans or pieces of plastic or tarp) are randomly placed in the distribution path of the spreader or an alternative is to place the collection devices in a row perpendicular to the line of travel of the spreader. After the spreader is driven over the collectors, the material is weighed. The application rate (lb/ac) is computed by dividing the amount of material collected, by the area of the collectors, and then converting the answer to the desired units of volume weight or mass divide by the area. An advantage of the perpendicular row of collectors is that the distribution pattern can be evaluated by plotting the amount collected from each collector on a graph. Problem: What is the application rate of a spreader that deposited 23.5 lb of material on two tarps, each measuring 10.0 ft x 12.0 ft? This method does not require a spreader wheel to be elevated, but you must be able to drive the spreader in the field or over an area as wide as the dispersal pattern. If the spreader is dispensing an excessive amount of material, the test area will be over fertilized. Problem: Determine the application rate and distribution pattern for a broadcast spreader that was calibrated by placing 20-2 ft2 collectors perpendicular to the direction of travel. The desired rate is 800 lb/ac. Table 8.1 shows the pounds of fertilizer collected. TABLE 8.1. Fertilizer collected during mobile calibration of broadcast fertilizer spreader. This is an acceptable level of error. The calibration is completed by plotting the distribution pattern. A plot of the distribution is shown in Figure 8.3. FIGURE 8.3. Distributor graph for spreader. application rate is acceptable, the distribution of the material is not. The cause of the poor distribution should be determined and corrected before it is used. Another mobile method can be used if it is certain that the spreader pattern is reasonably accurate. First, weigh the spreader, and then drive it over a measured area. Then reweigh the spreader. The difference between the before and after weights is the amount of material applied. The area is already known, so it is easy to find the application rate using mobile calibration equation. Both of these methods can be used to calibrate a fertilizer spreader. The choice and the materials used are up to the operator. How to calibrate granular fertilizer for agriculture? How to calibrate agricultural spreader? How to set up 2 inch venturi fertilizer applicator? How to callibrate grimme fertilizer applicator? What is a stationary callibration giving advantages? How to calibrate a fertiliser applicator?